Contrinex is launching a new range of safety light curtains that are claimed to set new standards in terms of reliability and value for money. Known as Safetinex, the modular design allows fully tested systems to be delivered very quickly. The new safety light curtains correspond to safety Category 4 (EN ISO 13849-1) and Type 4 (EN IEC 61496-1 and -2) and are designed to be used where risks cannot be eliminated through machine design. A person or any part of the body entering a danger zone is detected by the light curtain, resulting in immediate machine stoppage. Safetinex light curtains consist of a rugged sender and a receiver unit that demarcate the protection zone around the machine; the range comprises models with resolutions of 14mm for finger protection and 30mm for hand protection, with a maximum protective field width of 3.5 and 12m, respectively. The maximum protective height is either 1685mm (14mm resolution) or 1822mm (30mm resolution). 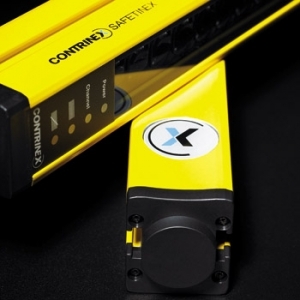 The signal processing method used in the Contrinex system ensures very fast response times. All Safetinex models offer a choice between two operating channels to avoid any likelihood of cross-talk between adjacent pairs of safety barriers. Connection is via an M12 or M26 connector, short cable (pigtail) with M12 connector or PUR pre-cabled, up to 10m long. In addition, the product range includes a Category 4 safety relay that can be configured for manual or automatic restart. Additional accessories include mounting brackets, which enable full angular adjustment, and T-bolts that fit into slots along each side of the barrier housing.